JAKARTA, Indonesia, May 3, 2018 /PRNewswire/ -- KinerjaPay Corp., (OTCQB: KPAY), a digital payment and e-commerce platform, today announced a major statement after being awarded by Indonesia Development Achievement Foundations (IDAF) in the category of "The Most Trusted Company in Digital Payment Solution of the Year of 2018". This event was held on Friday, April 27th, 2018 in Jakarta International Airport Hotel. The committee handed the award to the company as the winner of the category at the end of the day. Indonesia Development Achievement Foundation (IDAF) is a non-profit and non-politic independent organization that gives recognition and awards to companies. IDAF chooses and gives the awards to businessmen and professionals (government and private businesses) who have contributed and dedicated their creation to the society and made a good impact in customer service. 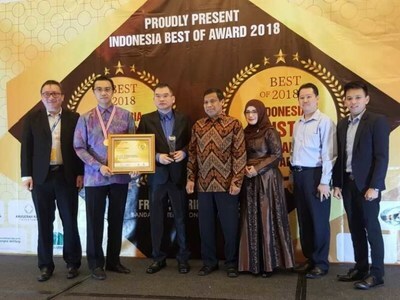 Mr. Edwin Ng, the Chairman & CEO of KinerjaPay Corp, commented, "This award is a result of our hardwork to build KinerjaPay as a reputable digital payment company in Indonesia. It also gives a strong testimony to everyone including our partners and shareholders that KinerjaPay deserves such recognition after its breakthrough in the Indonesian market. We see this as a stepping stone to achieve our vision and mission. We always ensure that we give our highest quality of service to every user. I am grateful for every staff and director who have supported our company to be better each and every day."